I’ve had this idea for a wallpaper cake series for a while, and now, as of today, it’s finally here! 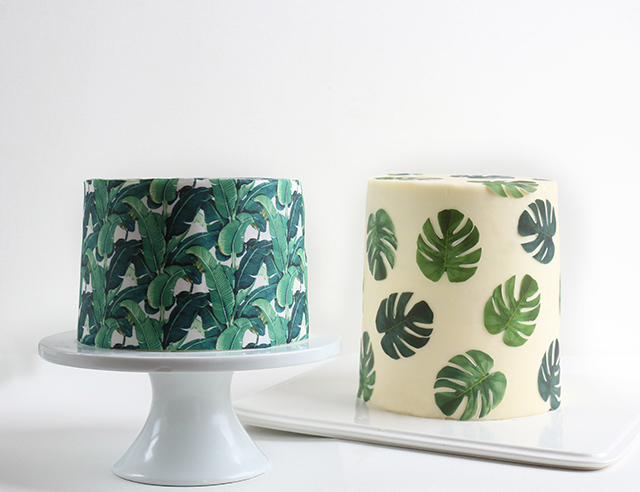 The first installment of my wallpaper cakes is for these tropical prints – the iconic banana leaf wallpaper print (aka martinique) and a jungle-y philodendron leaf print. And instead of keeping the cakes nice and pretty, I even cut into one of them for any of the skeptics who may find themselves saying “nahhh, that looks too cool to be a cake.” Continue on for the directions. Step #1: Create a design of your choice for your cake. If you’re using a spontaneous print (i.e. 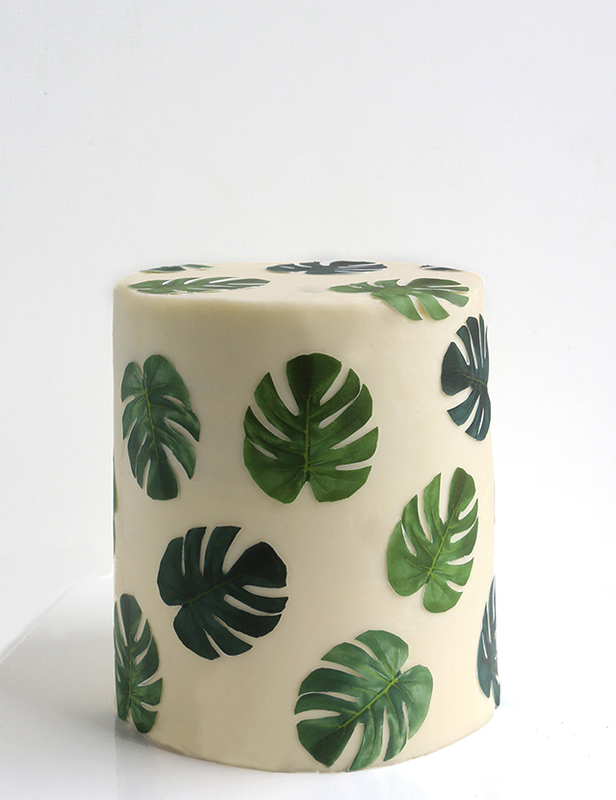 something like my philodendron leaf cake), use Photoshop – or a similar digital design program- to repeat the design in an 8.5″ x 11″ document. For a wrap-around, traditional wallpaper print, also load the print into an 8.5″ x 11″ document. Use Photoshop or Illustrator to repeat the design if necessary. Step #2: Once you have your document ready to print, you can print it yourself if you happen to have edible paper and ink. But if not, no worries – I definitely don’t own an edible printer either! Regardless of where you live, there should be an edible printer somewhere close to you. I chose to head to a fancy (overpriced) cake store in Manhattan to have mine printed for $15 a sheet, but after additional research I found out that Wal-Mart stores, along with many other bakeries, offer edible printing for what I’m going to guess is probably a little less than what I paid. Step #3: Once you have your edible print, you will need to either cut it to size (if wrapping around the cake) or cut out each individual image. If you’re just planning on adding cut-out designs, go ahead and cut those out and stick them on the cake, pressing firmly to secure each cut-out to the buttercream. For the repeated, wrap-around pattern you will likely need (2) of the 8.5″ x 11″ printed sheets of your design to wrap around the entire cake. Hold the design up against your cake (without touching the cake) to determine where you need to cut it for the height. Once trimmed, wrap the sheet(s) around the cake until the cake’s sides are covered, pressing firmly to adhere the paper to the buttercream. Next, cut out two semi-circles for the top using your leftover paper and piece them together. Pick one point that lines up with the design along the side, and use that as the front of your cake for when you display it. Step #4: Once your edible paper has been adhered and smoothed to your buttercream, it’s ready to display and serve! Avoid humidity and multiple temperature changes (i.e. fridge, to hot room, to fridge…), as that will cause the cake to sweat and the moisture will break down the paper. 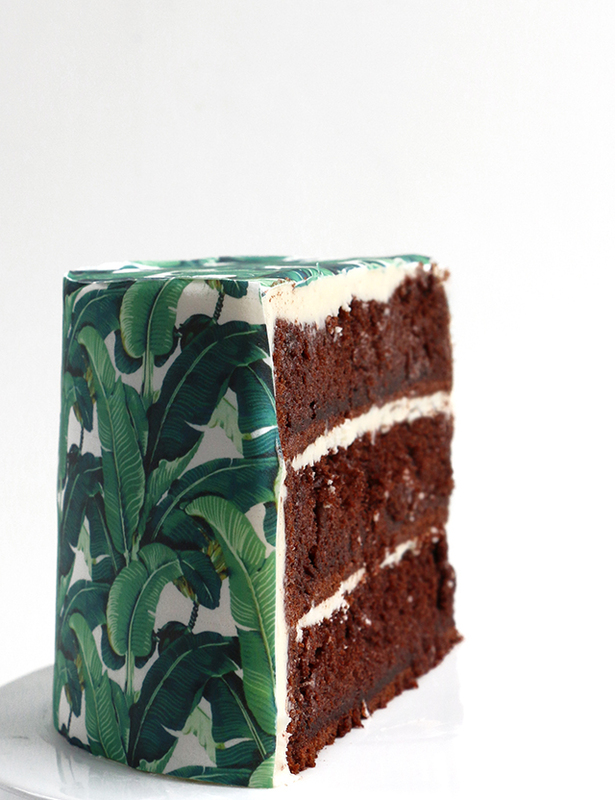 If you dig these cakes, you may also like my Tile Cake series. These are insane. Not only a great idea, but your attention to detail and craftsmanship are bonkers. Love it. Eye candy! Love this idea!!!! So creative. I love this! 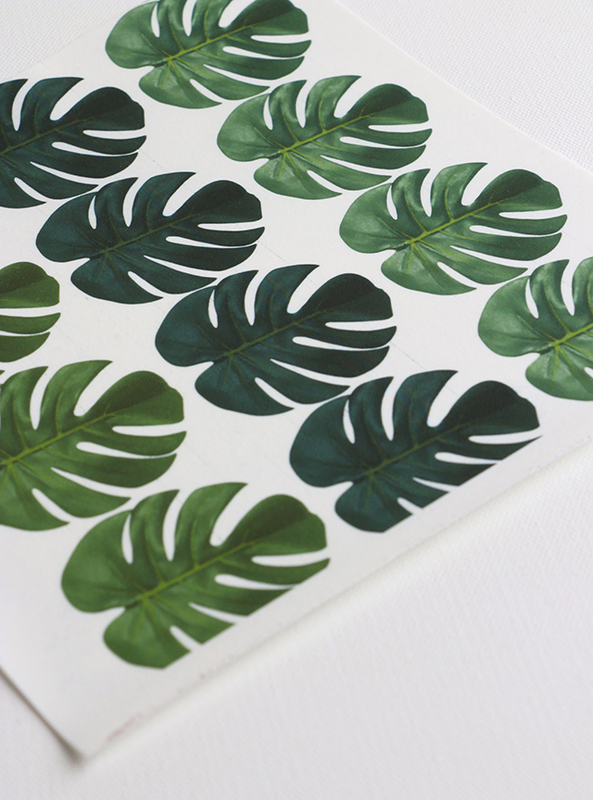 Can you upload the leaf sheet so I can print it out myself?! I LOVE the martinique Beverly Hills Hotel banana leaf print. Can I ask what image you used? 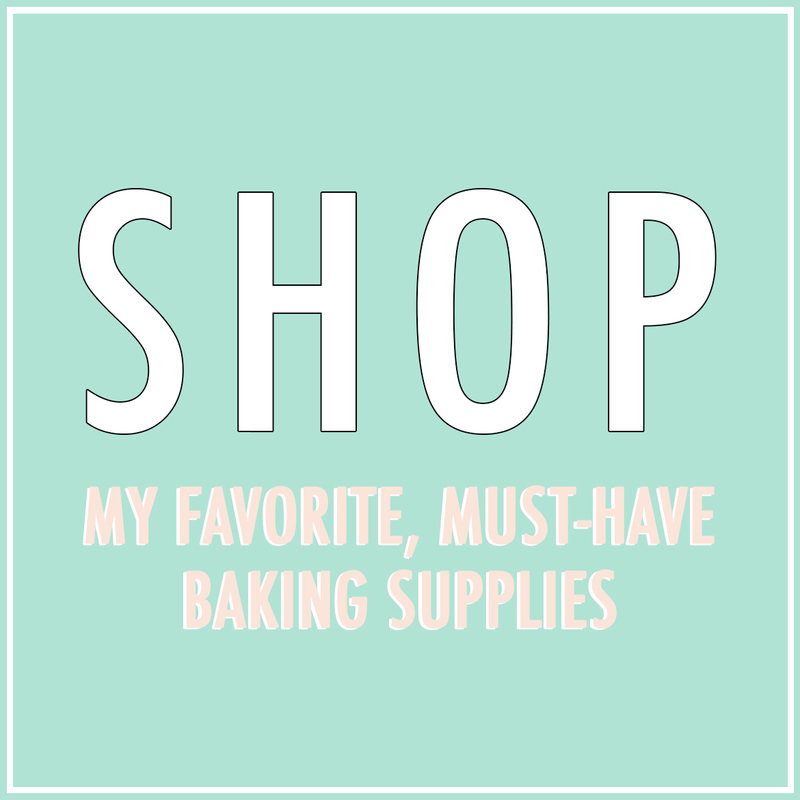 I want to make sure mine is the best quality. Thank you! The Original Martinique Wallpaper and Fabric is available. 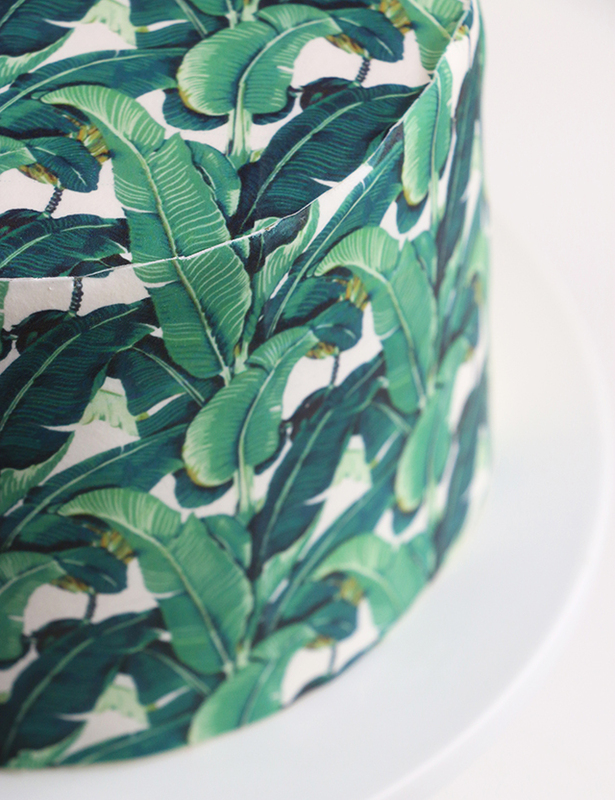 The print may not be available for more cakes due to copyright issues. Find it at http://martiniquewallpaper.com/ The cake looks amazing! Beautiful! Is it possible to take your own pics (like my dog etc.) And then transfer the image to the edible paper. I am a newbie but I would love to earn how. The possibilities are enormous! I cannot believe these amazing cakes are edible, how fantastically beautiful and creative, Ive no doubt we will see these wonders become very fashionable in the very near future. dee. s p e a c h l e s s ! Just discovered your blog thanks to Pinterest ! Where can I find a download for this print?! I can’t wait to try it! TIA! I’m also looking for this print file!! Any suggestions or help on where I could find this would be great. How did the cake taste? Does the paper affect taste or texture at all? Beautiful & brilliant.Love your site, thanks for sharing. 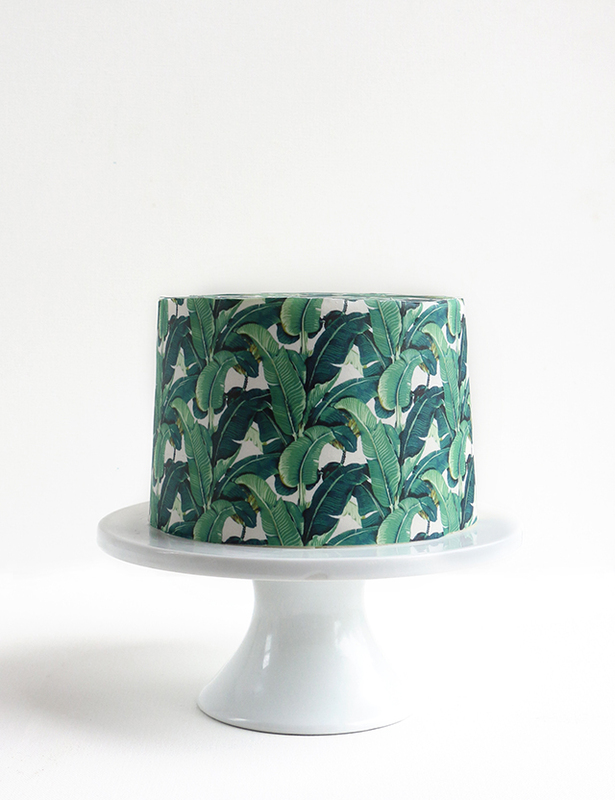 Tropical Wallpaper Cakes | Inspire Me! these are AMAZING! I wish I had the skill and patience to make this. Very cool! What? This is just so so incredible. Love it! The Fig's Heart | Weekend Reading. wow thank you for sharing! this is so incredible! All I can say is “Wow”, “I love this” so creative!!!!!!!!!!!!!! So great! I’m going to try making this for a birthday party next weekend. 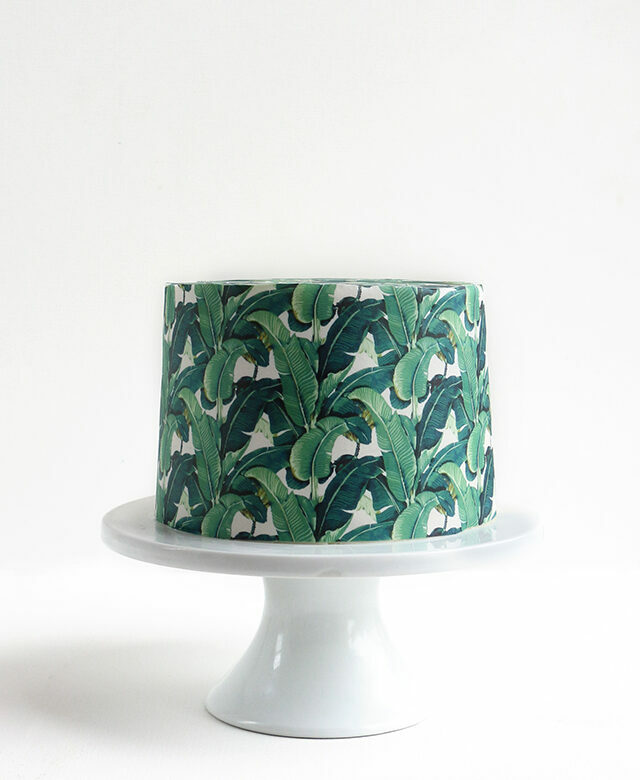 2 questions if you have time – 1) Do you recommend storing finished cake in fridge overnight (taking it out right before the party), or should I wait until right before I’m ready to serve that I frost and decorate? 2) Does the paper cut easily? Did you have to use an extra sharp or serrated knife?